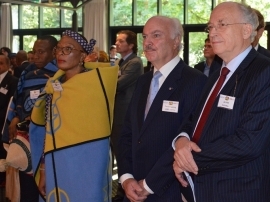 On the 4th of October 2016, SANEC and NAFTC-Africa organized an exquisite reception in honour of the Kingdom of Lesotho’s 50th independence day at Kasteel de Wittenburg in Wassenaar, the Netherlands. It was a successful and well attended event, thanks to the presence of several southern African Ambassadors and over 50 companies with 90 diverse guests. We would like to give a special thanks to H.E. Ambassador Mpeo Mahase – Moiloa from the Kingdom of Lesotho to the EU and her staff for celebrating this special day with us. The venue and live band contributed to making it an exceptional and festive afternoon that offered a unique insight into Lesotho and its investment opportunities. At the event, a Memorandum of Understanding was signed by H.E. Ambassador Mpeo Mahase – Moilo, Jan Hak (NAFTC-Africa) and Frans Engering (SANEC) in which is constituted that there is a mutually accepted need to set up a Netherlands-Lesotho, Agricultural, Food & Technology Platform in Lesotho. We also wish to thank our sponsors, Hak&Partners, Geerlofs Refrigeration, VanDrie Group, Ridder HortiMax, Tradin Organic and Ploeger Oxbo Group for making this event possible. Please click here for a photographic impression of the reception.